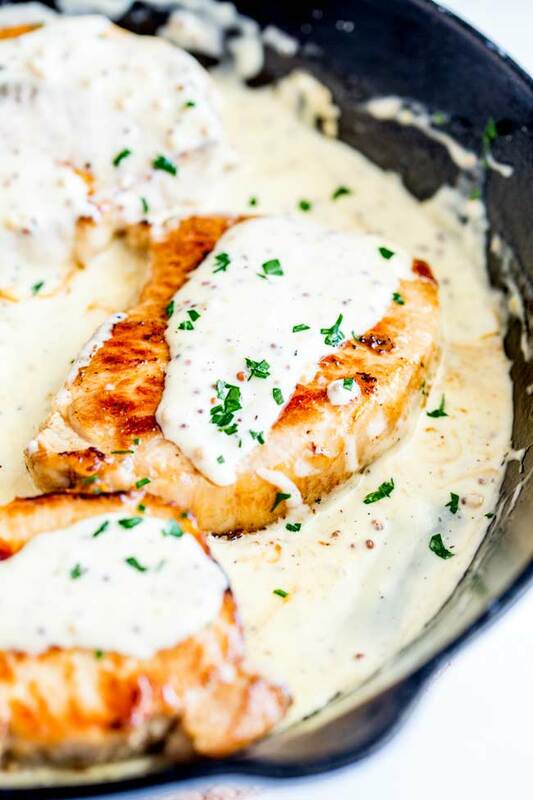 These Creamy Honey Mustard Pork Chops make a great midweek meal. Ready in under 20 minutes and all cooked in one skillet, this easy low carb dinner is one for the whole family. The pork is seared until golden then a creamy sauce, packed with the flavors of honey and mustard, is made right in the same pan. 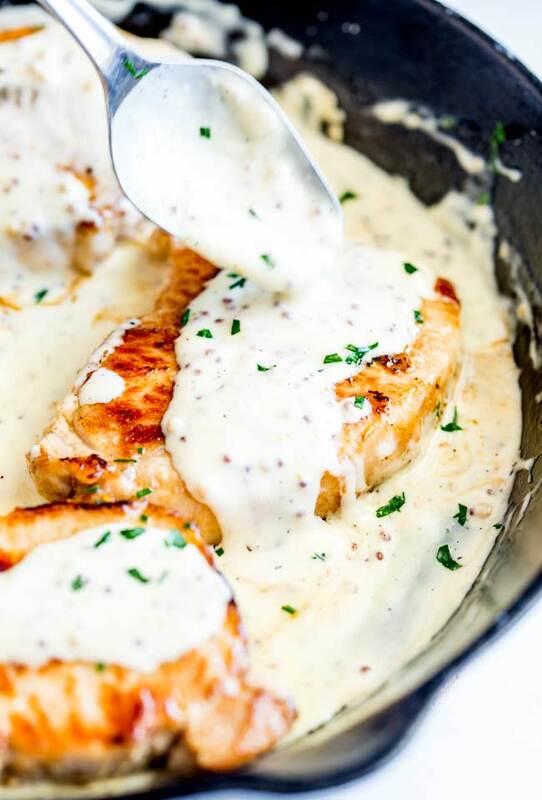 The addition of heavy cream and milk give you a deliciously smooth and creamy sauce. What is the difference between all the Pork Chops? We have so much choice in our grocery stores now and that is great! But sometimes that choice can get overwhelming! So here is my simple run down of pork chops. Rib Chops: These comes from the rib section (hence its name) of the big and have aa large bone running along one side of the meat. They are usually tender and have a good pork flavor. Center Cut Loin Chop: This pork chop cut has a t-bone in the middle with loin meat on one side, and tenderloin meat on the other side. These chops are perfect for the high heat of a BBQ and takes just minutes to cook through. Loin Chop: These are essentially the same chop as above but with the tenderloin part removed. These make a great all rounder. Boneless Chop: A lean chop with no bone, which means it is very quick to cook but can be easily overcooked. The mild flavor and lack of bones make them perfect for kids! Shoulder Chops: Also known as Blade chops or blade steaks, these chops are best for braising. They are very flavourful but they tend to have a lot of fat and bone, that needs time to break down so slow cooking these is best. 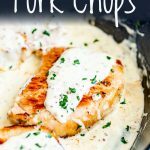 So which Pork Chop to use in this Creamy Honey Mustard Pork Chop Recipe? Depending on whether you want a bone or not, my choices would be a loin chop or a boneless chop. The rib chop does have plenty of flavor but when I am serving the kids I want it to be easy to eat and super tender so I will go with the boneless chop. But you can use any of the cuts above with the exception the shoulder chop which needs a long braise. The most important thing to remember when cooking pork is not to overcook it. Overcooked pork chops are dry and tough and no one wants that! Pork chops don’t take long at all, just a few minutes on each side and they will be juicy and succulent. To cook your pork chop, start by getting a cast iron skillet or non-stick fry pan hot and then add a tablespoon of olive oil. Season the pork generously with salt and pepper and then sear them in the hot oil. Cook them over a medium high heat for 3 minutes on each side until the internal temperature is 145ºF/62ºC. This will give you a juicy pork chop. For this recipe we cook the pork for just 2 minutes a side as it will have a bit more time to cook when we add it back into the sauce. Everyone loves the combination of honey and mustard. my kids demolish this sauce, and one of them isn’t a honey fan and is a serious mustard hater! He is old enough to acknowledge that it makes no sense that he loves creamy honey and mustard sauce but isn’t a honey or mustard eater, but he stands firm in his opinion that honey and mustard together in a creamy sauce taste better than the component parts. And who am I to argue! I would certainly choose this dreamy delicious sauce over a spoonful of honey or a teaspoon of mustard! This is a really simple sauce to make. The honey and mustard are mixed together with the milk and cream then bubbled gently for 2 minutes whilst the pork rests. The sauce is thickened with a little cornstarch before you add the pork back into the skillet. The sauce calls for dijon mustard and whole grain mustard, this gives you the best of both worlds. You get plenty of flavor from the Dijon and then the attractive mustard seeds from the wholegrain. But if you only have one type, then just use that. 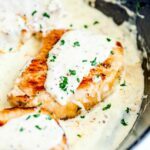 I do love thickening sauces with cornstarch, you get a beautifully creamy sauce using milk and maybe just a splash of cream. It is what I did for my Creamy Champagne Chicken. 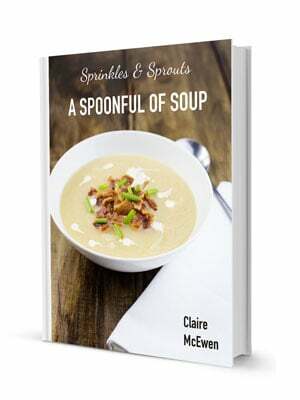 And that is one of my most popular chicken recipes here on Sprinkles and Sprouts blog! Side: Asparagus is my first choice fo this dish, but this creamy sauce demands something to mop it up, either some crusty bread or a bed of fluffy rice. If you are avoiding carbs then add some roasted broccoli and cauliflower, they both benefit from the sauce and will work well with the pork. Wine: Matching a wine to the sweetness of the honey and spice of the mustard in a creamy sauce, can be tricky. Some would go for a lightly oaked chardonnay, but chardonnay isn’t my favourite so I prefer to go with a Gewürztraminer or a dry Riesling. They work well with the sauce and don’t cancel out the flavor of the pork. Red is harder to match and I find most fight the sauce. The best I have found is a light Pinot Noir but I would still choose the Gewürztraminer. 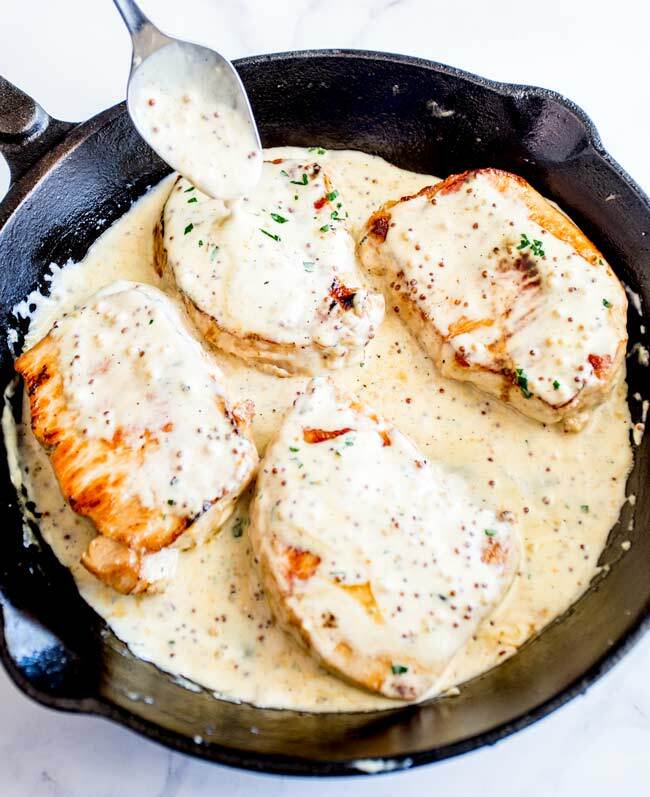 Why not pin this recipe for Creamy Honey Mustard Pork Chops. If you LOVE pork then why not check out my pork tenderloin with roasted strawberries. It is so easy to make and looks sensational! Place a large nonstick skillet/frypan over medium high heat. Whilst the pan is heating up pat the pork chops dry and then season them generously with salt on both sides. Add the oil to the pan and cook the pork chops for 2 minutes on each side. Add the butter to the pan and cook for a further minute. Reduce the heat under the pan to low and then remove the pork chops to a plate, leaving the butter and oil in the pan. Tent the plate with foil. Add the honey and mustard to the pan, then slowly stir in the cream and milk. Season with a little salt and pepper then bring to a simmer, stirring occasionally until the sauce has combined. Pour the cornstarch mixture into the centre of the skillet and stir constant until the sauce thickens. Add the pork (and any collected juices) back to the pan and simmer for a further minute until the pork has cooked through. Using both dijon and wholegrain mustard adds flavor and texture. But you can use one type of mustard if that is all you have. 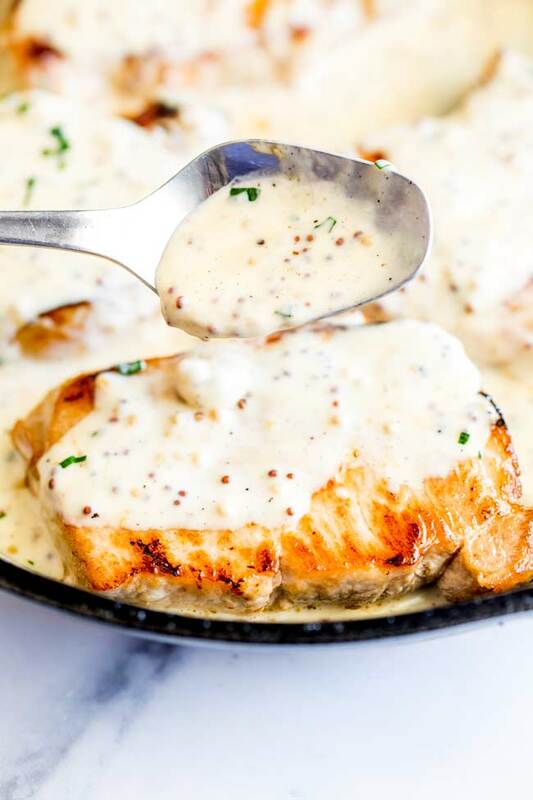 If you love food why not subscribe to my newsletter, I will drop you an email every now and then, just to say hi and send you a couple of recipes I think you might love, like these Creamy Honey Mustard Pork Chops.